Portal	Board index Popular Freshwater Fishes. Cichlids. Forum for discussion on Cichlids. 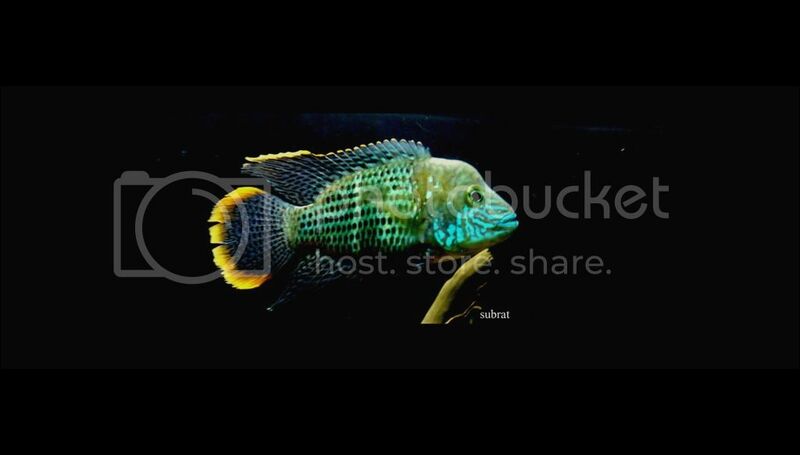 Personal view : very active fish,less aggressive at young age but as it matures will show why its name is green terror,growth rate is very slow as compare to other big SA cichlids . Personal view : most popular cichlid in the hobby, i am keeping a pair of tiger oscar from 1" sized now both are one foot long, grow very fast ,very messy eater,most of the time swim top of the tank looking for food. Personal view : are semi aggressive ,grow at fast rate , eats every thing what i offer, mine it aquatic plants cutting also. Nice thread if kept alive by people. Will definitely post here. MTS: Multiple tank syndrome ! Abhi wrote: Nice thread if kept alive by people. Will definitely post here. Personal view : are very aggressive and territorial,very hardy fish can adjust different water parameters , black background and quality food will enhance its beauty. likes to eat algae on roots. People here keep planted threads running other than that what thread do you see ? Look at the arTs and the highest post and topic counts are under planted tanks. So my reply was my opinion on what I saw . Abhishek Ji, you can also be a contributor in this topic. SCORPIO wrote: Abhishek Ji, you can also be a contributor in this topic. He has already expressed his desire to contribute here, and what he has said earlier is extremely correct, members should come forward and appreciate the efforts made in starting a thread by contributing to it. Cool photos, are you the owner? ?